Given the recent focus on the challenges to representative democracy, and the search for new institutions and procedures that can help to channel increasing participation, this book offers empirical insights on alternative conceptions of democracy and the actors that promote them. With a focus on the conceptions and practices of democracy within contemporary social movements in Europe, this volume contributes to the debate on the different dimensions of democracy, especially in its participative and deliberative forms. 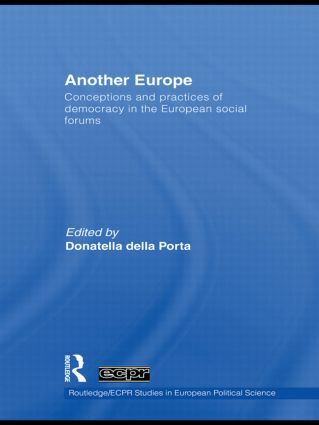 On the basis of an in-depth analysis of European Social Forums, gathering thousands of social movement organizations and tens of thousands of activists from all Europe, the book explores the transnational dimension of democracy and addresses a relevant, and little analyzed aspect of Europeanization: the Europeanization of social movements. From a methodological point of view, the research innovates by covering a group of individuals traditionally neglected in previous studies: social movement activists. Qualitative and quantitative methods are employed to research individual motivations as well as environmental dynamics. The various chapters combine analysis of the individuals’ attitudes and behavior with that of the organizational characteristics, procedures and practices of democracy. Providing a cross-national comparison on the global justice movement, the theoretical challenges of the new wave of protest and offering rich empirical data on contemporary activism, this book will appeal to students and scholars of comparative politics, sociology, political sociology, social movement studies, as well as transnational relations.